For the adventurous fishermen who want to immerse themselves in the beautiful and bountiful Canadian wilderness, Redden's offers Outpost Camps. These two camps are situated on two of the most beautiful and bountiful fishing lakes in Northwestern Ontario. Redden's has ensured that your stay is a pleasant one. All of the cottages are fully modern and offer, cooking appliances (propane), generators for your electrical needs, satellite television and DVD players, and all of your leisure needs are taken care of by Mother Nature. Enjoy your time in the rugged Northern wilderness. Stay at one of Redden's outstanding Outpost Camps. Immerse yourself in Mother Nature. Dryberry lake is a large interesting lake that has a lot of native history attached to it, such as ancient pictographs and camp sites, where artifacts are regularly discovered. It has many large beautiful natural beaches and abundant wildlife that can frequently be seen along the shore, such as moose, bear, wolves and much more. Our Outpost Camp on Dryberry Lake sits up high on an Island of its own in the North East side of the lake and has a spectacular view. It has a large fully modern cottage that can accommodate up to eight people with all the comforts of home. The cabin is set up for housekeeping and has everything needed to take care of your everyday needs, pillows, cooking, cleaning supplies etc. as well as indoor entertainment with satellite television and a DVD player. A gas generator provides electricity plus propane and solar power make it possible to operate as much or as little as you wish. A radio phone is supplied if for any reason you should have to reach the outside world. Dryberry ViewDryberry Lake is undoubtedly the best Musky lake the area has to offer. With its beautiful clear cold water you can regularly see the fish charging your bait from great distances. Trophy sized fish are caught and released each year. Other species such as Small mouth Bass and Northern Pike are also available. For the die hard Musky fisherman who wants to enjoy the ultimate Musky fishing experience or the serenity of the location or both, Redden's Camp on Dryberry Lake is the place for you. Our outpost camp on Lake of the Woods sits in a beautiful secluded bay on the northwest corner of Big Island, the biggest island in Lake of the Woods. It has a small fully modern cabin which can accommodate a maximum of 6 people. The cabin is set up for housekeeping and has everything needed to take care of your everyday needs, cooking cleaning, bedding etc. as well as indoor entertainment with satellite television and a DVD player. A gas generator provides electricity plus propane and solar power make it possible to operate as much or as little as you wish. A cellular phone may be used at this location if for any reason you should have to reach the outside world. Big Island dock with successful fishermen.This part of Lake of the Woods, around Big Island, is famous for it's tremendous Musky fishing, abundant Walleye, Small / large mouth Bass, Northern Pike, Crappie & Perch. It also has some great duck hunting which when combined with a fall Musky trip can make for a varied and unique experience. There are several trails around the property that you can walk and observe the local wildlife. It is not unusual to see moose, otter, beaver, bald eagles, blue herons and a wide variety of other wildlife. It is also only a short walk to a beautiful natural beach. 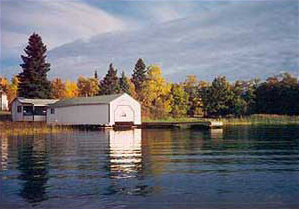 For the ultimate in great fishing, peace and relaxation on the Lake of the Woods, Redden's Camp on Beautiful Big island is the place for you.